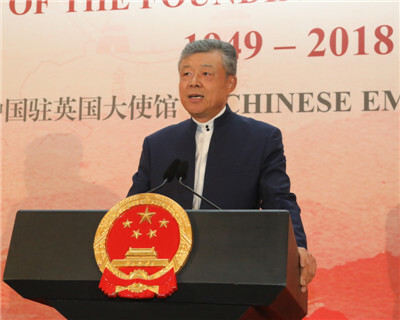 On the evening of September 27, 2018, a grand reception celebrating the 69th anniversary of the founding of the People’s Republic of China was held at the brightly-lit Landmark London. H.E. 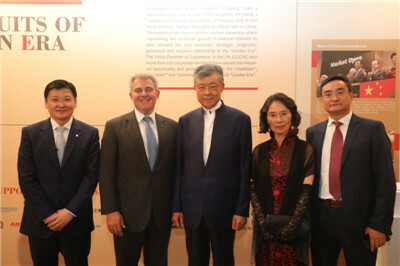 Ambassador Liu Xiaoming and Madam Hu Pinghuan hosted about 600 people at the event, including the Rt Hon. Brandon Lewis MP, Minister without Portfolio and Chairman of the Conservative Party, the Rt Hon. Emily Thornberry MP, Shadow Secretary of State for Foreign and Commonwealth Affairs, Lord James Sassoon FCA, Chairman of China-Britain Business Council, Lord Timonthy Clement-Jones CBE, Deputy Chair of APPCG, Mark Hendrick MP, Vice Chair of APPCG, Lord Powell, Lord Kennedy, Brigadier Simon Levey, Head of Foreign Liaison Staff (FLS), MoD, Graham Cregeen MHK, Minister for Education, Sport and Culture in the Isle of Man, Lord Jim O'Neill, Chair of Chatham House, Stephen Perry, Chairman of the 48 Group Club, Donald Brydon CBE, Chairman of London Stock Exchange Group, Sir Alan Yarrow, former Lord Mayor of London and representatives from British government, parliament, industry and business, science and education, culture and media sectors, as well as the members of London diplomatic corps, overseas Chinese and students, and Chinese institutions in the UK. 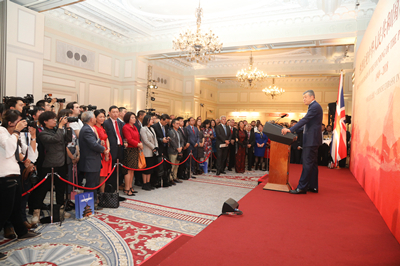 At the reception, Ambassador Liu delivered a warm speech. He pointed out that in the 69 years since the founding of the People’s Republic of China, especially over the past 40 years since China’s reform and opening up, the Chinese people have stood side by side, conquered various difficulties and achieved brilliant progress in our national development and rejuvenation. The Ambassador summarized China’s reform and opening up with four great achievements, namely mapping out a new journey for China’s national rejuvenation, opening up a new prospect for socialism with Chinese characteristics, writing a new chapter of a China that embraces the world, and creating new opportunities for the development of China and the world for many years to come. Looking ahead, the two countries should uphold three principles. The first one is mutual respect and trust, which is important in building the “Golden Era”. The two countries should respect each other’s core interests, major concern, national sovereignty and territorial integrity and never harm each other’s core interests or undermine their strategic trust. The second is mutual benefit, which is important in gathering new impetus for common development. China and the UK should match their development strategies to deepen high-standard and high-quality cooperation on the Belt and Road Initiative to help translate their complementary advantages and development opportunities into concrete outcomes. The third is following the trend of the times, which is important in contributing positive energy to international cooperation. In today’s world, unilateralism, protectionism and populism are surging and international economy and trade face severe challenges. China and the UK must join hands to safeguard the rule-based multilateral trade regime and make greater contribution to world peace and development. 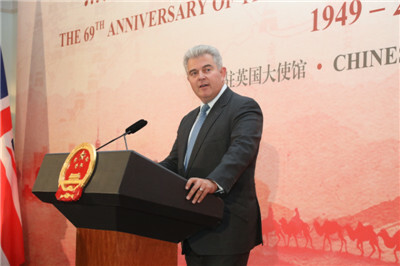 In his speech, Minister Lewis extended his congratulations to the Chinese government, Chinese people and overseas Chinese on the National Day. Hailing the sound momentum of China-UK relations, he said that the British government attaches great importance to China-UK relations. In the “Golden Era” of China-UK relations, the two countries have achieved remarkable results on cooperation in various fields in recent years. China-UK bilateral trade has been increasing with British companies taking a leading position in the Chinese market, especially in finance. On the other hand, China will be one of the largest investors of the UK by 2020, with increasing number of Chinese tourists visiting the UK. Currently, the UK is advancing Brexit and focusing on building a “global Britain” by actively developing global partnerships. As one of the most open markets and the best investment destinations in the world, the UK is at the forefront of global financial innovation, while China is the fastest growing market. The two countries have broad prospects for cooperation. In the future, the UK is willing to strengthen cooperation with China in the areas of capital market connectivity, RMB internalization, trade and investment, and continue to cooperate closely on global and regional issues such as health, security, education, tourism, sports and climate change so as to contribute to world peace, stability and prosperity. 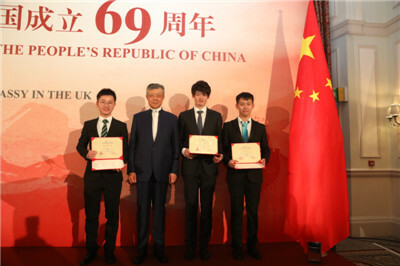 At the reception, the Chinese Embassy held the Awarding Ceremony of the CSSAUK High-level Entrepreneurship Challenge with the Ambassador presenting the certificates to the first prize winners. 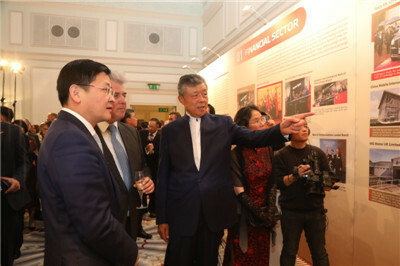 A photo exhibition in celebration of people-to-people ties over the five years of the Belt & Road Initiative, a China-UK Trade and Business Cooperation Exhibition displaying the achievements made by the two countries in photos and objects, and an exhibition in Promotion of the 15th World Chinese Entrepreneurs Convention were also held at the site. The guests watched a promotional video of the first China International Import Expo, and enjoyed a live demonstration of Chinese cuisine and a performance of traditional Chinese folk music. 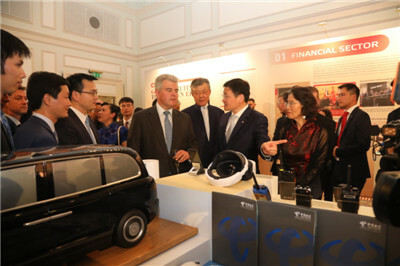 Ambassador Liu and Madam Hu Pinghua joined Minister Lewis and other guests to watch the music performance, view each exhibition booth and taste the Chinese foods. The atmosphere at the reception was warm and friendly. The guests hailed China’s remarkable achievements of reform and opening up and extraordinary contributions to promoting free trade and an open world economy. They expressed their hope that China-UK “Golden Era” would remain a sound momentum, and their readiness to continue to contribute to China-UK relations and the cooperation and exchanges in various fields. Xinhua News Agency, People’s Daily, CCTV and Pheonix TV reported on the reception and interviewed Minister Lewis and other guests.